Whether you seek alternate sources of protein to avoid the pitfalls of red meat or you just want more variety in your meal plan, lobster makes a welcome addition to your health-conscious diet. Its mild, sweet flavor works in a variety of dishes, and it also contributes toward your daily nutrient intake. But watch out for some traditional lobster dishes, such as lobster rolls, because they come loaded with fat, which reduces the nutritional value of your meal. Lobster also has a few nutritional drawbacks of its own, so you should consume it in moderation. Lobster serves as an excellent source of lean protein. Each 6-ounce portion provides you with 28 grams of protein but only 1.2 grams of fat. This protein provides amino acids -- small compounds your cells can assemble into new proteins needed to maintain healthy tissue. Protein nourishes your bones and cartilage to keep your skeleton strong and also supports the health of your blood. A 6-ounce serving of lobster contains just 0.3 grams of saturated fat -- approximately 1 percent of your daily recommended allowance. While not typically thought of as a bone-building food, lobster provides minerals you need for skeletal health. Each 6-ounce serving of lobster boasts 274 milligrams of phosphorus and 140 milligrams of calcium. This provides 39 percent of your daily phosphorus requirement as well as 14 percent of your recommended daily calcium intake. Both minerals form components of hydroxyapatite -- the dense, strong mineral abundant in your bones. Calcium also supports nerve health, while phosphorus nourishes your cell membranes. Lobster also nourishes your brain by boosting your intake of choline and vitamin B-12, two essential nutrients. Choline supports the production of neurotransmitters -- small compounds involved in brain communication -- while vitamin B-12 helps maintain myelin, a substance that coats your nerves and supports nerve transmission. Choline also maintains the health of your cell membranes, while B-12 promotes red blood cell function. A serving of lobster provides you with 120 milligrams of choline -- 22 percent of the recommended daily intake for men and 28 percent for women -- as well as 2.1 micrograms of vitamin B-12, or 88 percent of your daily B-12 intake recommendation. 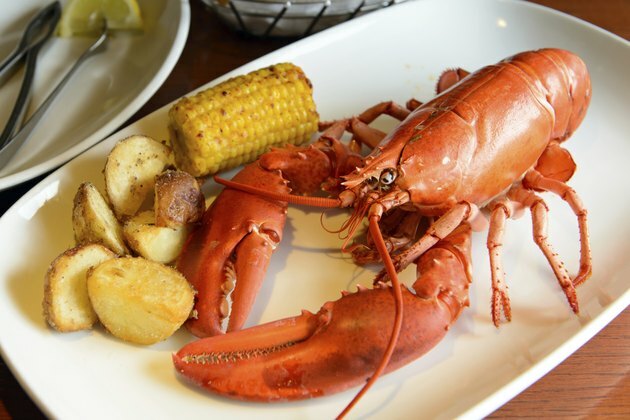 While lobster offers several nutritional advantages, it's also high in sodium and cholesterol. Each 6-ounce serving of lobster contains 719 milligrams of sodium and 216 milligrams of cholesterol. This contributes a significant amount toward the suggested daily limit of these nutrients -- 2,300 milligrams for sodium and 300 milligrams for cholesterol. Both nutrients have the potential to harm your cardiovascular system. Sodium contributes to high blood pressure and cholesterol can contribute to high blood cholesterol levels -- two risk factors for heart disease. If you already suffer from high cholesterol or heart disease, you should limit your cholesterol intake to 200 milligrams daily, and a single serving of lobster exceeds your daily limit. Forgo the drawn butter when consuming your lobster -- not only does it pack on the calories, but it increases your intake of harmful saturated fat. Similarly, avoid lobster rolls made using white bread and fatty mayo. Instead, serve your lobster steamed and seasoned with cracked black pepper or grilled and topped fresh salsa -- a mix of mango, pineapple and cilantro really brings out its sweet flavor. Use leftovers in sandwiches made with whole-grain bread, or use lobster meat to add protein to your favorite salads. Make sure to watch your portion size to avoid consuming too much sodium and cholesterol, and make lobster an occasional treat rather than a regular part of your diet.